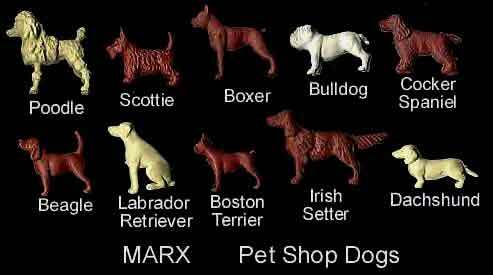 I have heard two lines of thinking on how Marx added the dog to this set. 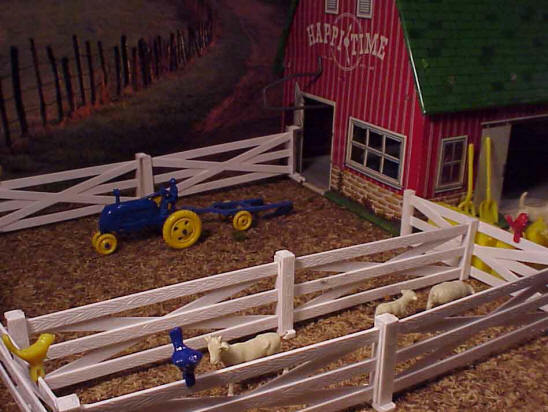 One theory is that Marx added a dog to this farm set at random from the dogs available in this mold. The other thought is that only a few of the dogs were used, and they were ones that would be most likely to be seen on a farm. My sets seem to confirm the second line of thought in that only the Setter, Lab, and Beagle were used. The Sear's Wishbooks show both the Beagle and the Labrador. However, the Montgomery Ward catalog shows a Boxer! If the first theory of "dog placement" were true, then I would shudder at the implications. Can you imagine the trauma inflicted on some poor child who opened his farm set to find a Poodle dog?! Coming in second in humiliation would have been the inclusion of the Dachshund! 1. PL-162 Domestic Animals 6 cavities making 1 set - One mold shot would have the 3 large farm animals + the larger "draft" horse used in the earliest 60mm western towns and the mukle with separate back pack which was only sold (I think) as a counter item or in a small boxed (polka Dot Box) set with other pieces from this mold. 2. PL-163 Domestic Animals 9 cavities making 3 sets. 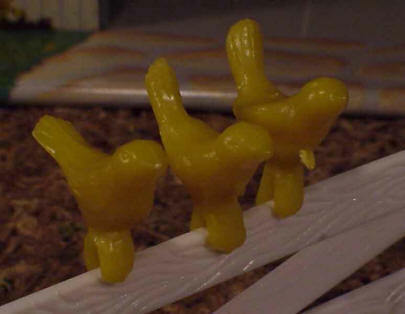 - One mold shot made enough for 3 playset groups. Also sold as counter display pieces and in a small boxed set. 3. PL-164 Domestic Animals 18 cavites making 3 sets (mold list goof says 6 sets). 5. PL-165 Domestic Animals (fowls) 27 cavities making 3 sets. I should include the small hard plastic birds with the animals. They come in blue, red and yellow and are in three poses. They came on circular sprues. 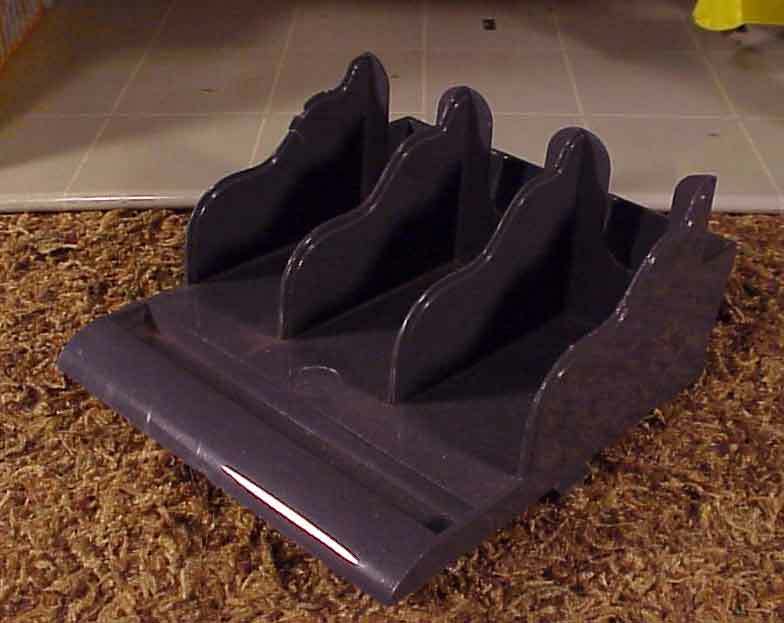 Their feet are designed as a slot so that they can fit on the fence tops! I think that the inclusion of birds was a great idea. They add to the overall pastoral ambiance. There are two sets of birds in each set (6 total). One of my sets had yellow and red, and the other had blue and red! Marx provided a lot of fence for his farms! There is enough fence to make corrals for the animals and still have fence left over for the "back forty" field. There is a cow stall that fits in slots on the barn floor. This is in gray hard plastic. It is a perfect fit for the cow. Also in gray hard plastic are three milk cans, and a loading platform. These are all very detailed. 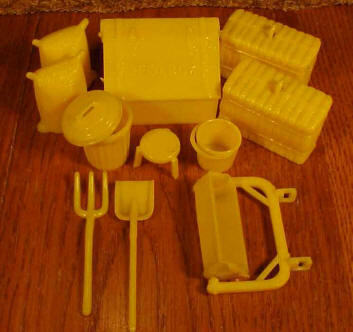 There is a set of bright yellow hard plastic farm accessories included. These are great! There are two bales of hay, a pitchfork, a shovel (for feed, dirt or manure-your choice! 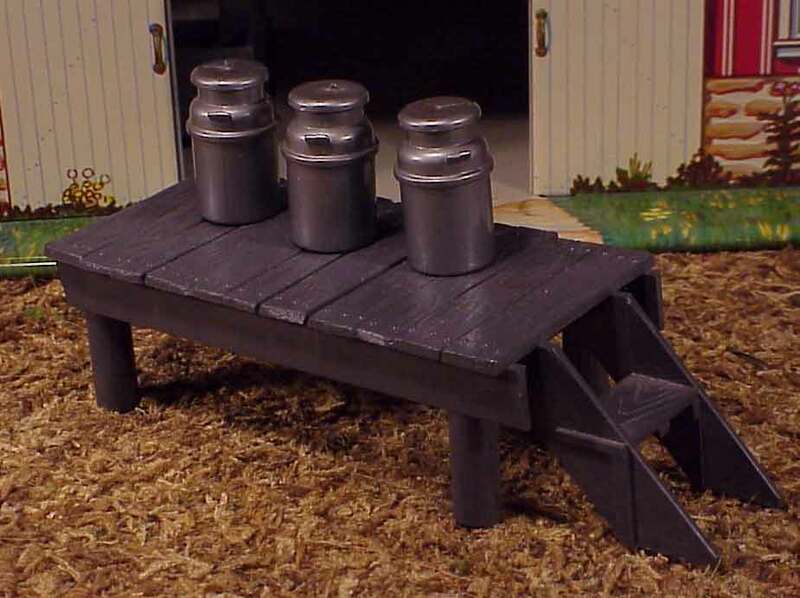 ), a milking stool, a milk bucket, two feed sacks, a trash can with separate lid, a large feed box with lid, a pulley, and a carrier of some kind (note that pulley not shown). The carrier slides on the metal track in the barn. 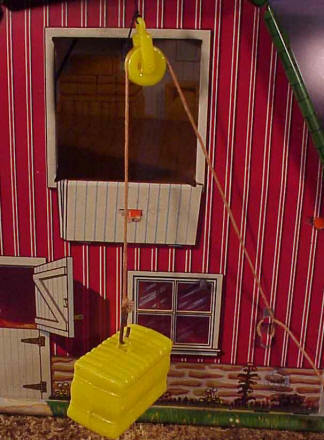 The pulley is designed to be able to be tied to a hole in the barn roof over the barn loft access. 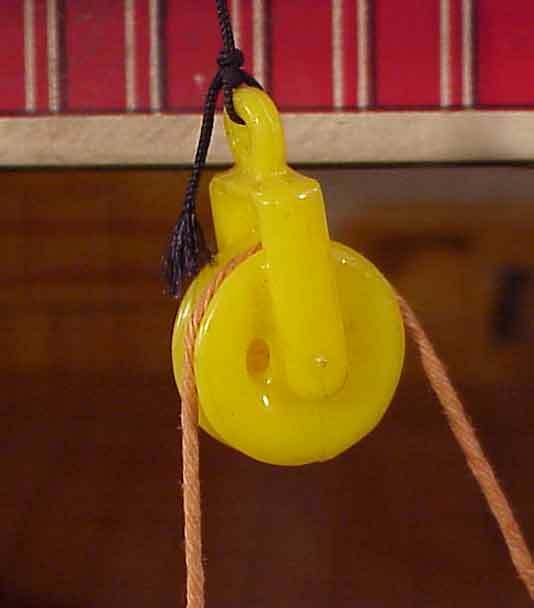 There is a metal hook on a thick string included. This fits into the ring on the top of the hay bales. In this way, the bales can be hoisted up to the hay loft. 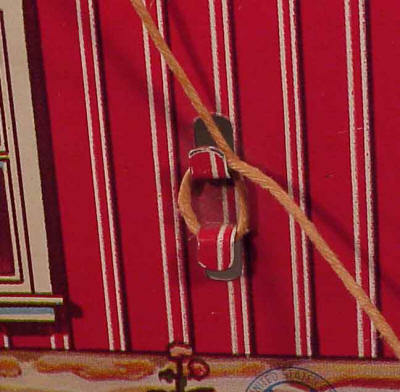 The side of the barn has two projections that have been cut away from the tin and bent so that the rope string can be tied to it. This is a great design that adds a lot of interaction with the set's components. Only one of my sets had the hook and string. I imagine it was easily lost.